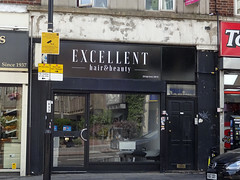 Hairdressers and beauty salon on the High Street. As of June 2018 we're not sure whether it's quite opened yet. It was previously a branch of Subway photo. As of October 2013 it was all closed up with a sign in the window photo stating that it was temporarily closed due to "a fire burn incident", and it remained closed as of January 2014. However, as of April 2014 it was open again. Subway finally closed down for good some time between March and October 2017 photo of notice. Last edited 2019-02-07 16:21:03 (version 29; diff). List all versions. Page last edited 2019-02-07 16:21:03 (version 29).